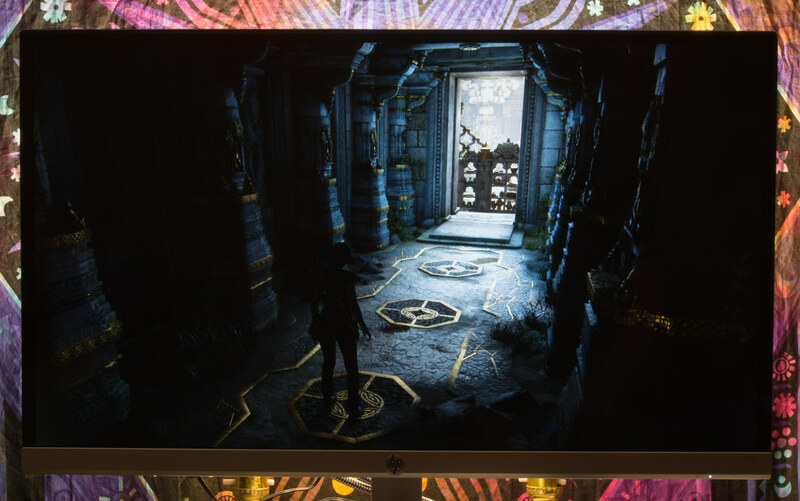 2018: HP 25f Review: Almost-Glossy 75hz IPS with AMD Free-Sync: 25er & 25es successor with AMD Free-Sync, native 75hz, the fastest pixel response times, but worse color accuracy than the 25er & 25es. 2x HDMI and 1x VGA. 2017: HP 24 Envy Review: Semi-Glossy 1080p IPS with 75hz & AMD Free-Sync: The 24 Envy natively supports 75hz (no overclock required), can cover more of the HDTV/REC 709 color space than the 25-27" HP monitors, but is less accurate than the HP 25er and 25es. Displayport, HDMI and USB-C.
2016: HP 25er/es Review: Non-overclock-able 2016 Almost-Glossy/Low Haze Monitors with slightly more accurate color presets than the rest, especially once the Contrast is reduced from 80 to 75. 2x HDMI and 1x VGA. 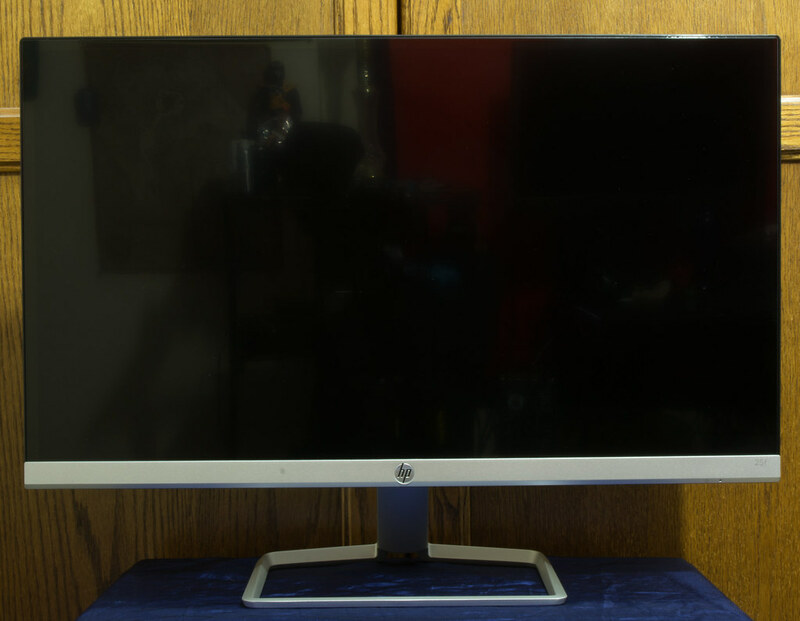 2015: HP 27CW, 25XW and 27XW Review: Overclock-able 2015 monitors with worse preset color accuracy than the 25er and 25es. 2x HDMI and 1x VGA. "The reflective-ness typical with glossy screen surface is appreciably reduced with the Low Haze Screen enhancement, without losing clarity and contrast of screen imagery." 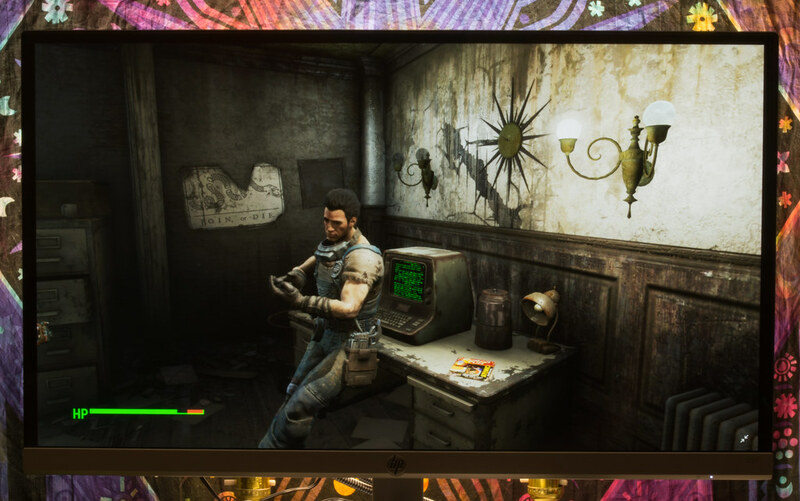 HP 25-27VX: These monitors use LED PWM Dimming or Flicker which ruins motion clarity and makes some people suffer from health issues like headaches and/or eyestrain. 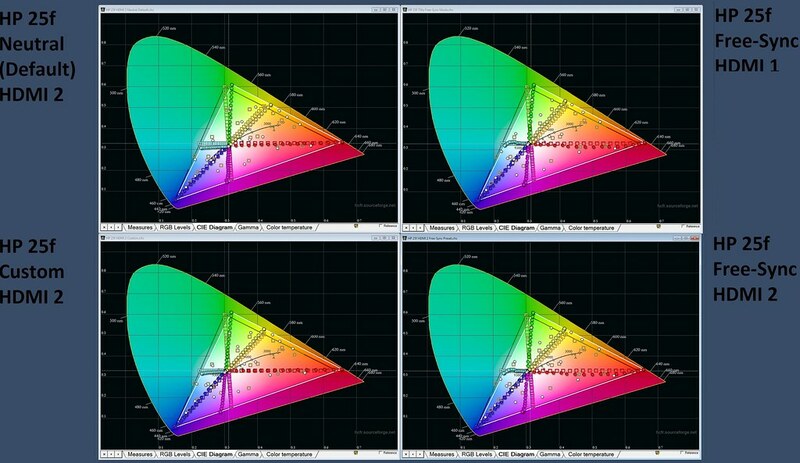 The VX monitors have less vibrant colors since they have a smaller and less accurate color gamut capable of covering up to 92% of the sRGB color space versus the 25-27CW & XW monitors 97%, and use a pure glossy coating while the 25-27 CW & XW monitors use a treated glossy or almost-glossy coating with some ant-reflective properties. All testing done using a SpectraCal C6 HDR2000 (upgraded i1 Display Pro Colorimeter; a colorimeter measures the colors, contrast, brightness, gamma, ect; proof of ownership), HCFR (program used to measure the color presets and verify calibration) and dispcalGUI for calibration. I use my own cables to connect the monitors to my PC and consoles. 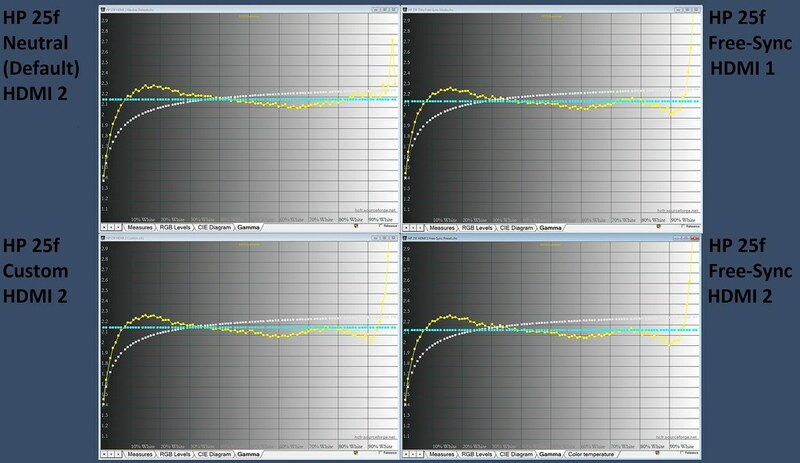 PixPixAn's (free software) Chase, Streaky Pictures and Flag tests were all used to test the pixel response times along with the Ghosting test from Test UFO. Input lag was tested with the Leo Bodnar Input Lag Tester. LCD monitor test images test patterns from Lagom were used to test the colors along with tons of photos from Wallpapers Wide. The HP 25f's casing and stand are an updated, but extremely similar variant of what its predecessors the HP 25CW, 25er, 25es and 25CW used , but the back of the er monitors casing is made of black plastic instead of white plastic like the 25er and 25es. 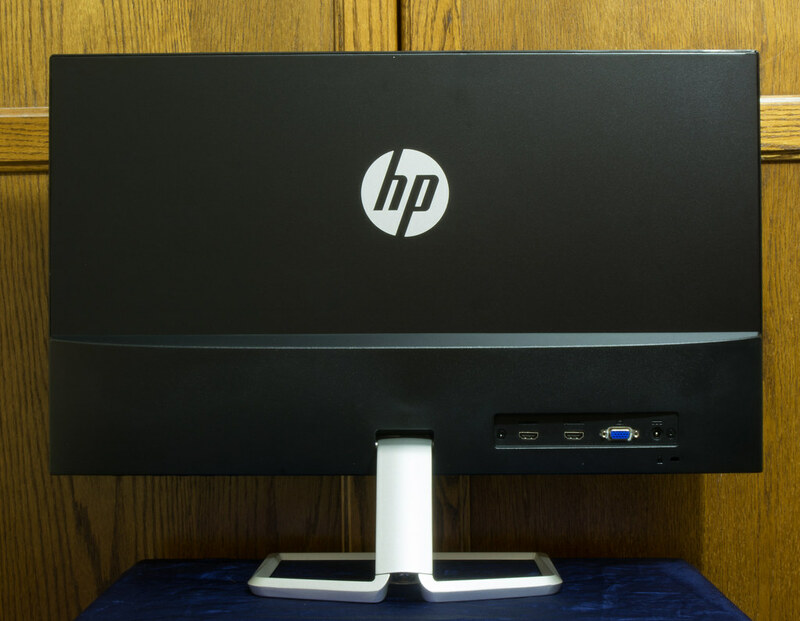 All of the HP 25-27" IPS monitors casings are made of sturdy plastic, while the easily detach-able "floating," stand is made of metal. 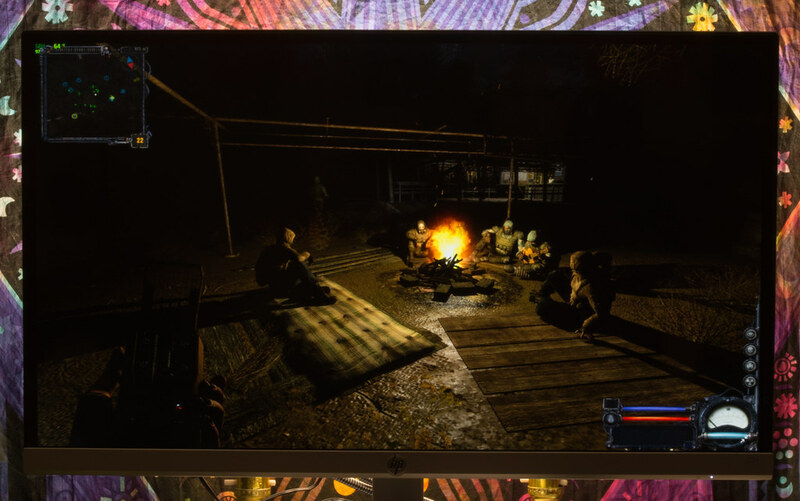 They 25f has the same fake bezel/frame-less design as the older 25-27 monitors which all have the same amount of inputs (2x HDMI & 1x VGA) and all have an inner black bezel which reduces the perceived black depth. 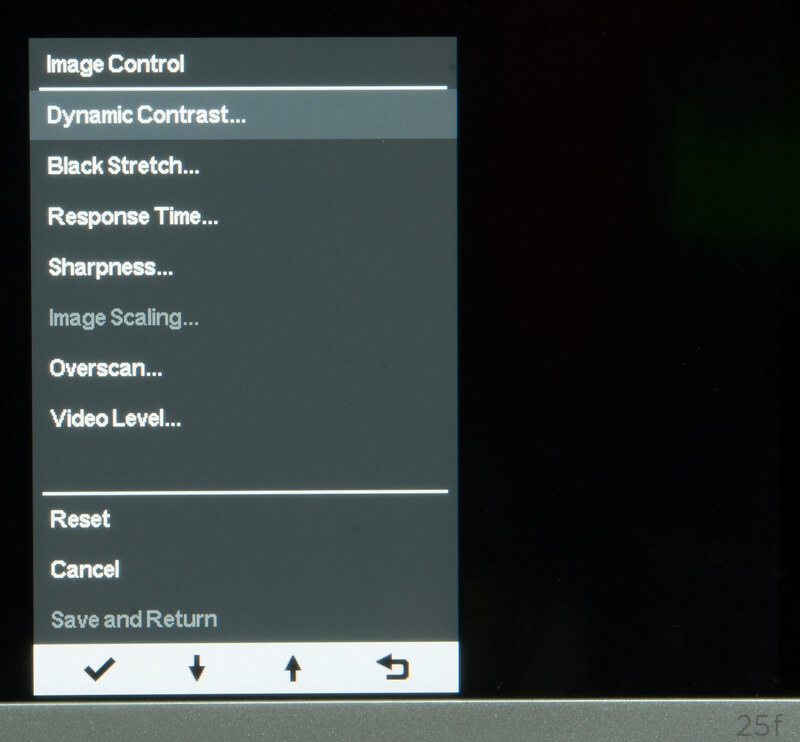 Just like the older monitors, the HP 25f needs to have its overdrive setting (Response Time in the Image Control menu) which controls the pixel response times increased since it is preset to the lowest setting by default. The Response Time setting needs to be set to Level 4 of 5 to provide the fastest overshoot ghosting free pixel response times, which are nearly on par with the fastest 60hz TN panels like the BenQ Zowie RL2460. 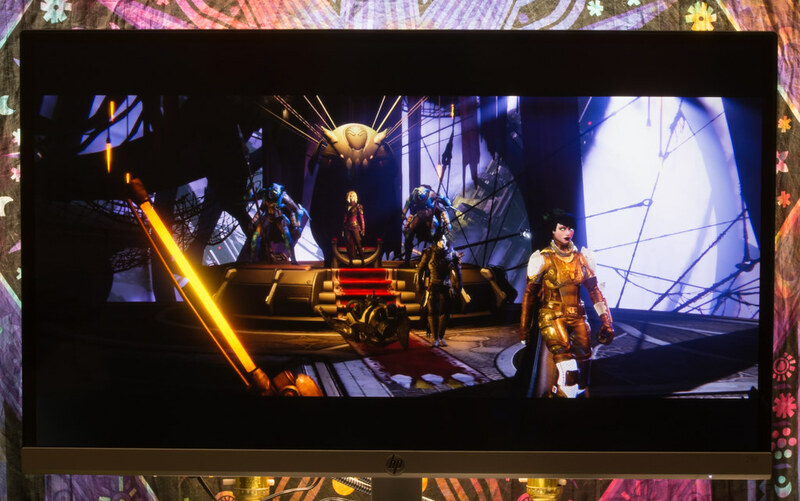 The AMD Free-Sync setting, Gaming - Free-Sync, in the Viewing Mode Menu must also be manually activated to enable Free-Sync with compatible AMD graphics cards and the Xbox One X. 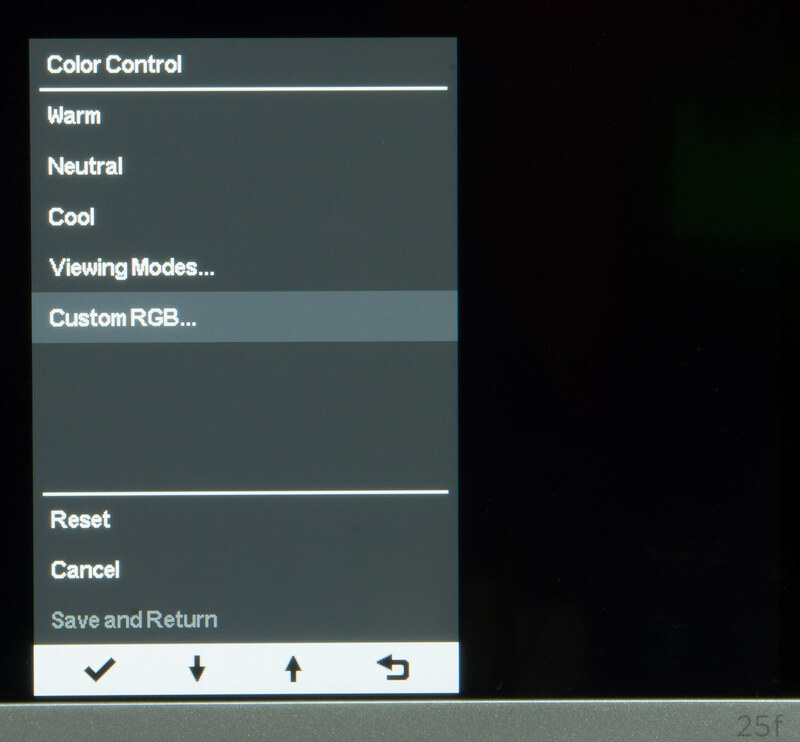 The Gaming - Free-Sync setting locks the color (Red, Green and Blue) controls, but not the Brightness and Contrast settings, and it provides the same preset color accuracy as the default setting. 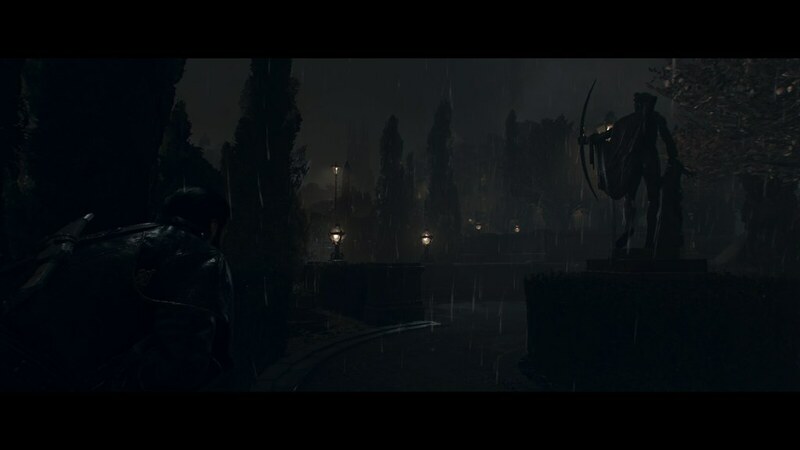 Then select Gaming - Free-Sync to activate the Free-Sync mode. Free-Sync must also be activated by the console (Xbox One X) and/or graphics card as well. Here's how to activate Free-Sync with the Xbox One X, and here's how to with compatible AMD and Nvidia graphics cards. 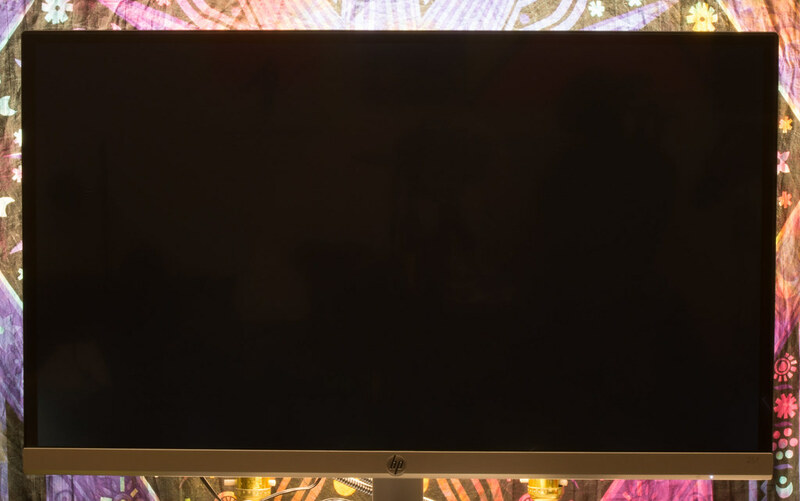 The HP 24 Envy, 25" & 27" HP CW/er/es/f/XW series monitors are not advertised as being Flicker Free even though they do not use LED PWM Dimming (read about the side effects), regardless of high or low the brightness is set. LED PWM Dimming was tested for using the Blur Busters Test UFO Blur Trail/PWM Test from 0-100% Brightness. 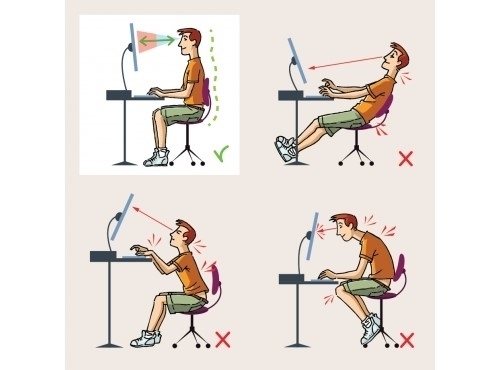 The lack of PWM is a good thing since PWM or Flicker ruins motion clarity (example), and makes some people suffer from health issues such as headaches, and/or eyestrain. The HP 25f is significantly brighter than older HP modes which all failed to output more than 300cdm/2, which is fine for most viewing environments. The 25f outputs over 450cdm/2 which makes it suitable for use with very brightly lit rooms, and possibly even outdoor use as long as the monitors screen is turned away from the sun. The 1200:1 contrast is above average (1500:1 is outstanding while 1200:1 is great) for a modern AHVA/IPS/PLS panel, but still way too low for use in a light-less room, especially if the brightness is set above 5 (100cdm/2). If the brightness is set to zero the HP can be used in a light-less room, but may still be a bit to bright for some since it can only dim down to 74cdm/2. 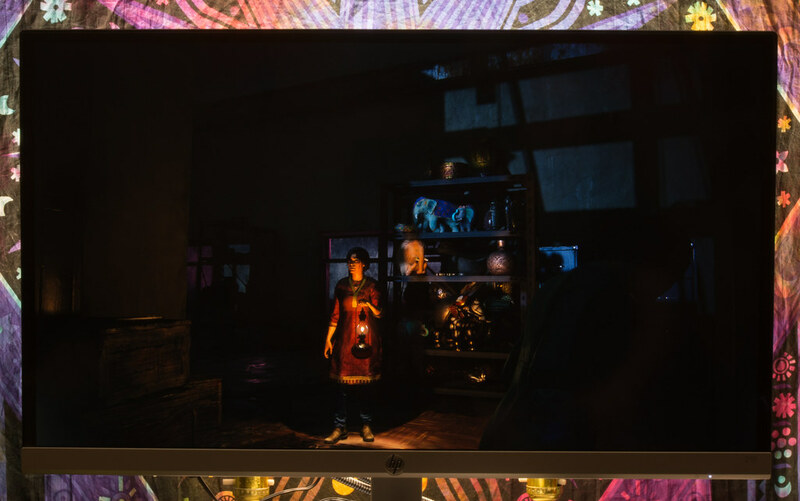 Like most other 1080p IPS/PLS panels, the HP 24 Envy, HP CW, er, es, f and XW monitors have frame-less casings which have inner black glossy bezels or frames which reduce the perceived black depth, or makes black look light (greyish) by comparison, but bias lighting (lamp placed behind the display) can be used to negate the need for reflection inducing room lights, and vastly increase the perceived black depth. "The reflectiveness typical with glossy screen surface is appreciably reduced with the Low Haze Screen enhancement, without losing clarity and contrast of screen imagery." The almost-glossy or low haze coating is equally as free from grain and sparkle, as well as equally as clear as a glossy coating, but is less reflective. The almost-glossy coating is also free from the white haze which semi-glossy coatings suffer from when placed under bright lighting conditions; reflections are mostly transparent and clear like they are on glossy coatings. Out of the box, or by default, the HP 25f and 24 Envy's Response Time or overdrive setting is preset to Level 1 while the HP 25 er and es have theirs preset to Off, just like the HP 27CW, 25XW and 27XW I reviewed in 2015 and 2016. The 24 Envy, 25er and 25es all offer extremely similar performance, the main difference being that the 24 Envy and 25f can natively overclock 75hz and support AMD Free-Sync. 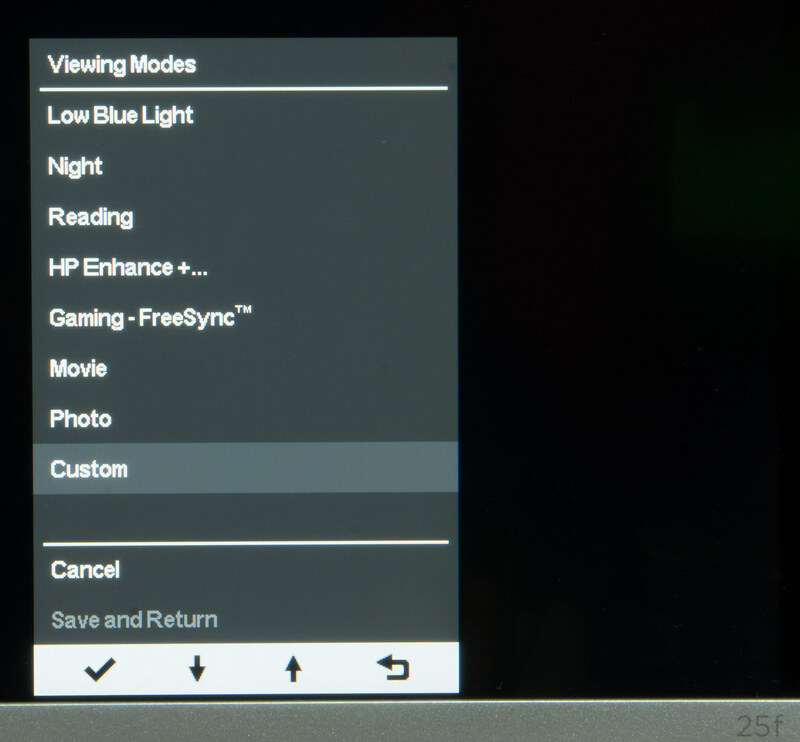 HP still has not learned to preset their monitors to use the best overdrive setting, but they did speed up the pixel response times and reduce the color streaking of the 25f significantly versus the older models best settings, but only when the 25f's Level 4 Response Time setting is selected. When Response Time Level 4 is selected the 25f is obviously faster than the older models, is completely overshoot ghosting free, and only suffers from very light amounts of color streaking. 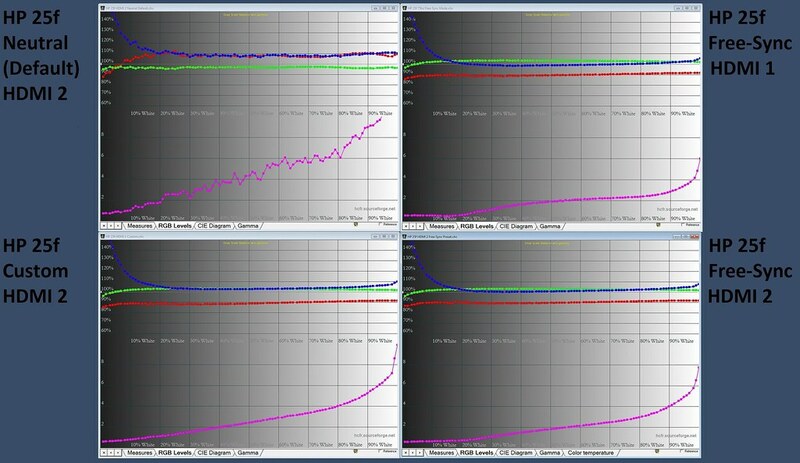 The HP struggles with fast yellow and white streaking the most, but this is normal for AHVA/IPS/PLS. 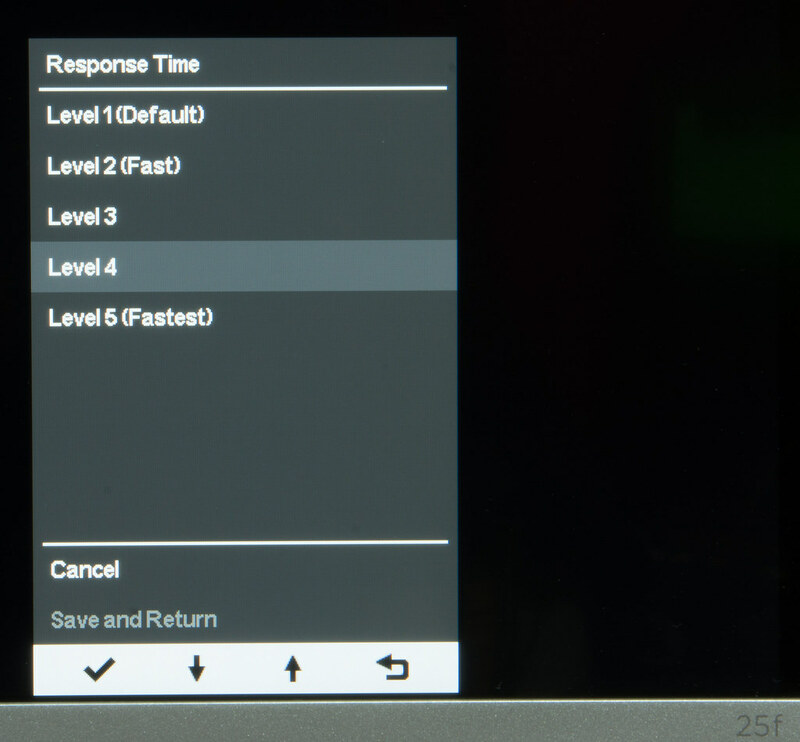 The Level 5 Response Time setting is useless since it causes very obvious overshoot ghosting which appears in the form of transparent colored, dark or white glow or shadows on things which move across the screen. 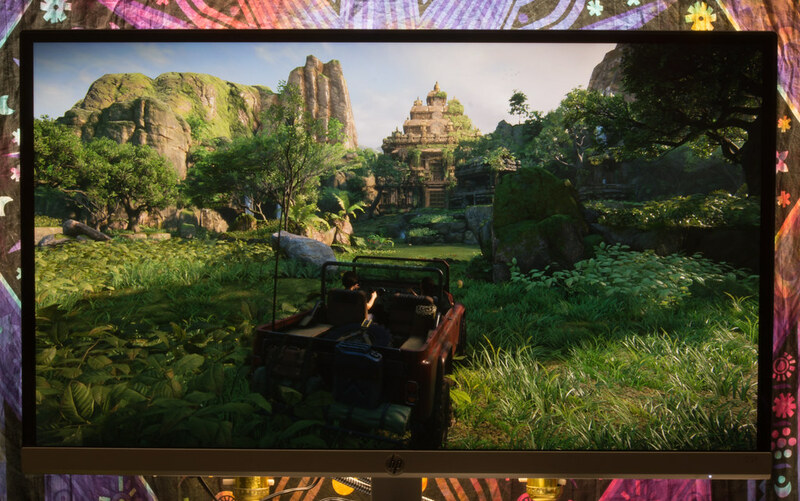 The 25f is not as fast as a high end 60hz TN panel like the BenQ Zowie RL2460, but is only slightly slower, and offers vastly superior image quality, especially when viewed properly. The HP 25f is also the only AHVA/IPS/PLS panel I've tested which rivals the 1200$ Acer XB321HK (60hz 4K AUO AHVA panel with G-Sync), which along with the HP, should satisfy all but those who want to use 144hz monitors. 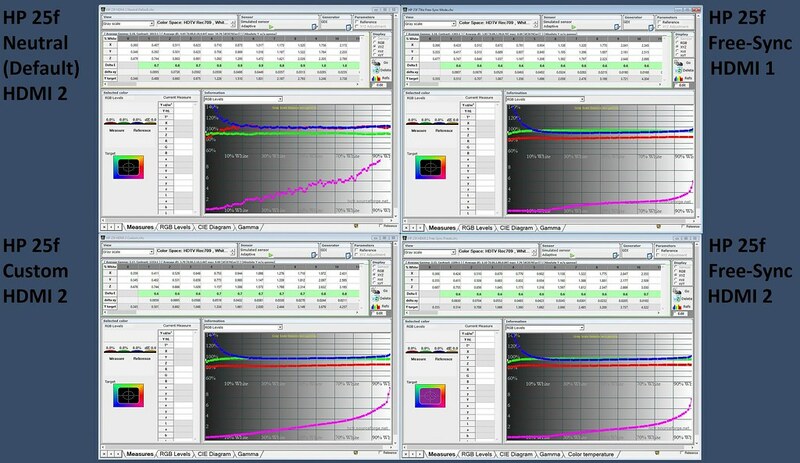 Here's a comparison of monitors ranging from 150$ US to 700$. Here's how to activate Free-Sync with the Xbox One X, and here's how to with compatible AMD and Nvidia graphics cards. 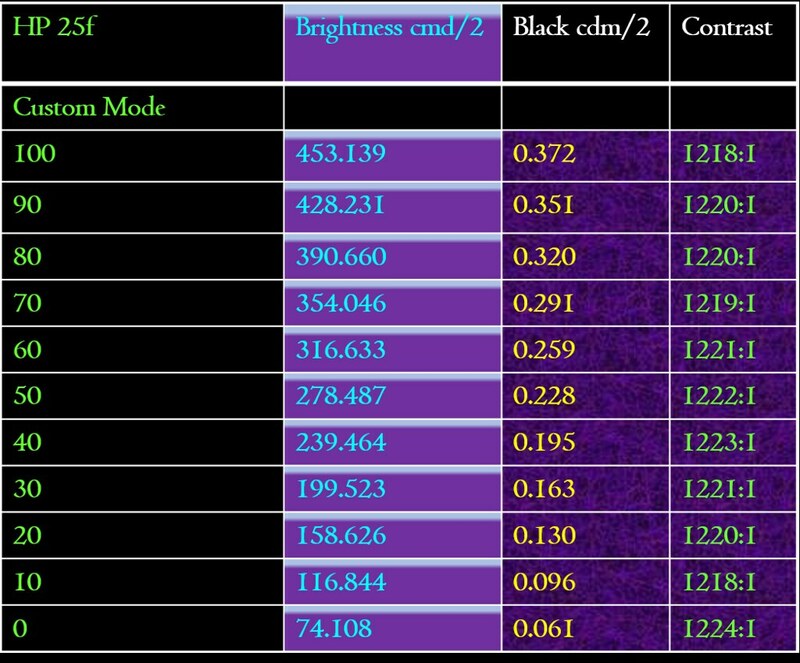 The HP 25f, 24 Envy and 25" & 27" CW/er/es/XW monitors can all be considered delay free (<3ms top screen Leo Bodnar measurement), but this is not surprising since most 1080p monitors are. 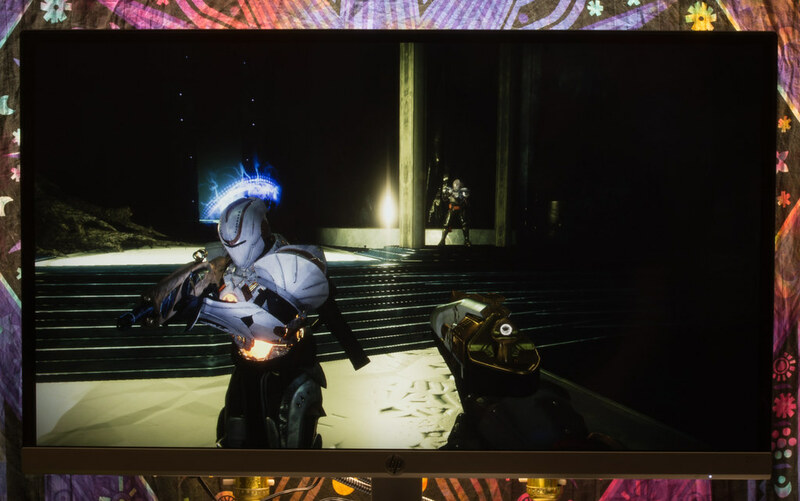 Usually only multi-input 1440p-4k monitors have a around a frame (16.7ms) or two (33.33ms) of input lag. The Leo Bodnar device measures 9.8ms in the middle of the screen, but the Bodnar device has a built in delay and partially includes the monitors black-to-white pixel response times. The actual signal delay (input lag without including the pixel response times) is likely around a millisecond, but an oscilloscope which I do not own, is required to obtain the "true" value. 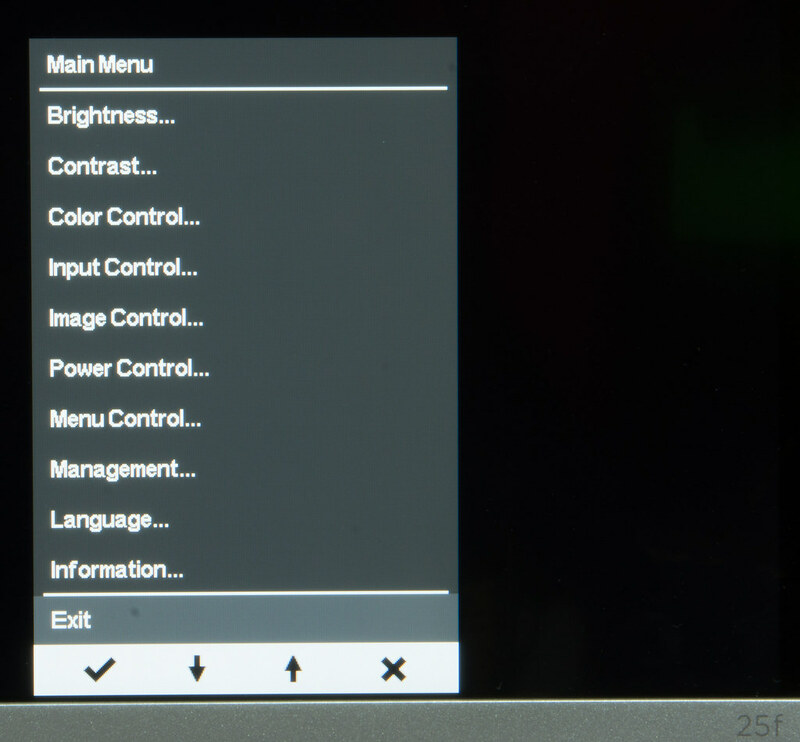 The Free-Sync mode offers fairly accurate colors for a budget display, but editing the color controls makes the 24 envy and 25f switch to the Custom Color mode which de-activates Free-Sync. 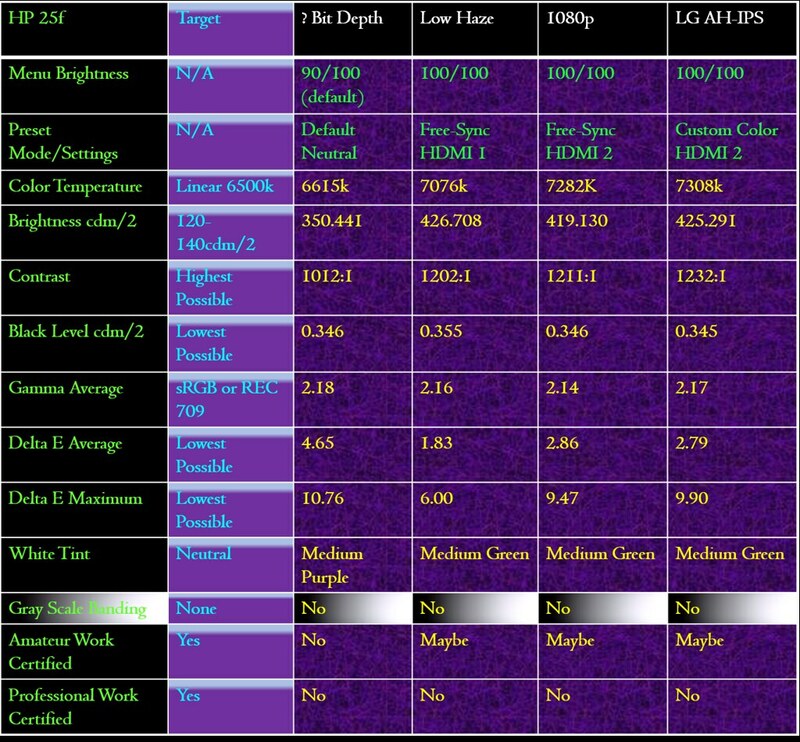 The 25er and 25es suffered from less of a preset green dominance, provided better gamma tracking (target=HDTV/REC 709 linear 2.2 standard) while the 24 Envy provided nearly complete HDTV/REC 709 and sRGB color space coverage, but had slightly too high gamma (2.42 average) which causes slight black crush or color and shade darkening. Aside from the contrast issue mentioned the HP 25er and 25es provide significantly better preset color accuracy than the 25f, which like the er and es, can not fully cover the HDTV/REC 709 or sRGB color space since they under-saturate some blue and green shades, and some over-saturate greens, reds and yellows. The 24 Envy also can not fully cover the HDTV/REC 709 and sRGB color space, but barely under-saturates color, and does not over-saturate colors. 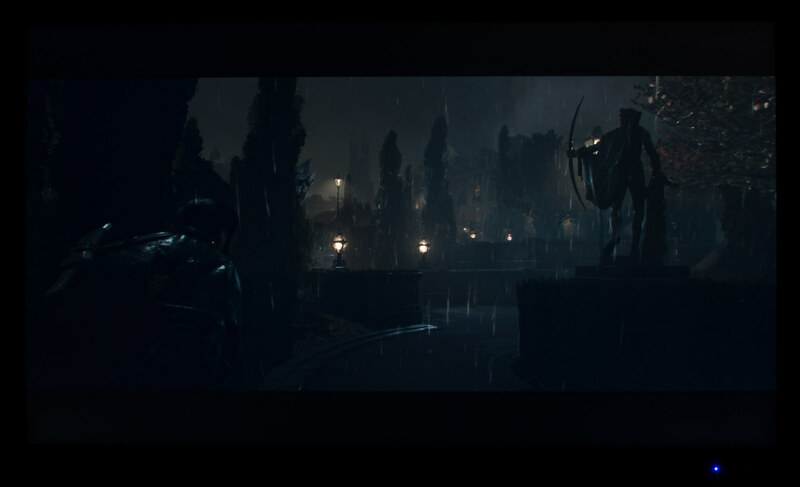 Overall the 25f has good but obviously flawed (versus a calibrated monitor) preset color accuracy, however this is to be expected for a budget 1080p IPS/PLS, and HP added AMD Free-Sync and 75hz support as well as fixed the preset contrast issue the previous two generations (CW & XW monitors from 2015 and the er & es monitors from 2016) suffered from. 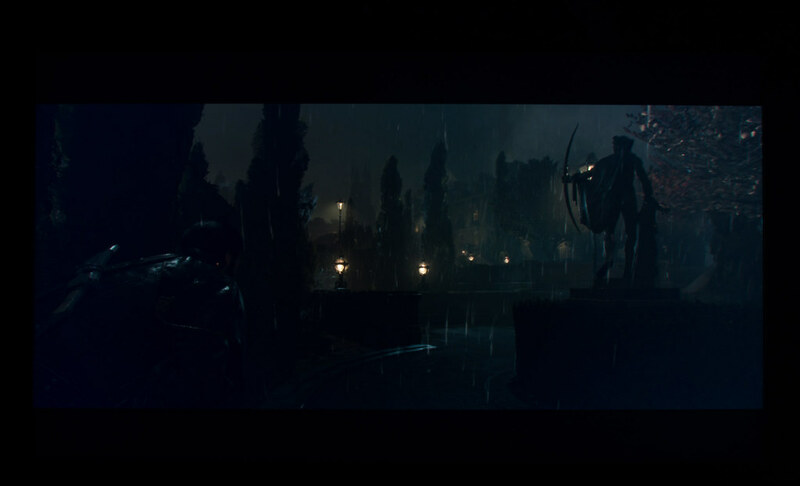 When the Free-Sync Viewing Mode is activated the 25f's main flaw, which is its preset green dominance, is mainly visible when viewing brown, grey and white, and is clearly demonstrated in the first (grey bedroom in Dying Light) and fourth (black and white screen shot from the Fallout 4 opening) un-calibrated versus calibrated photo comparisons found in the next section of this review. 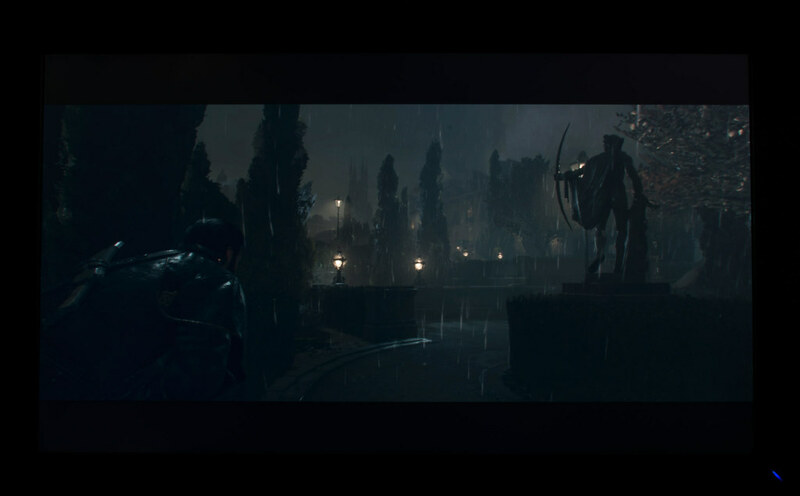 In this post the Free-Sync mode, which in my opinion is the mode important preset-mode, is compared to my calibration which does not apply to the Free-Sync mode which must be selected to activate Free-Sync with the Xbox One and Xbox One X. 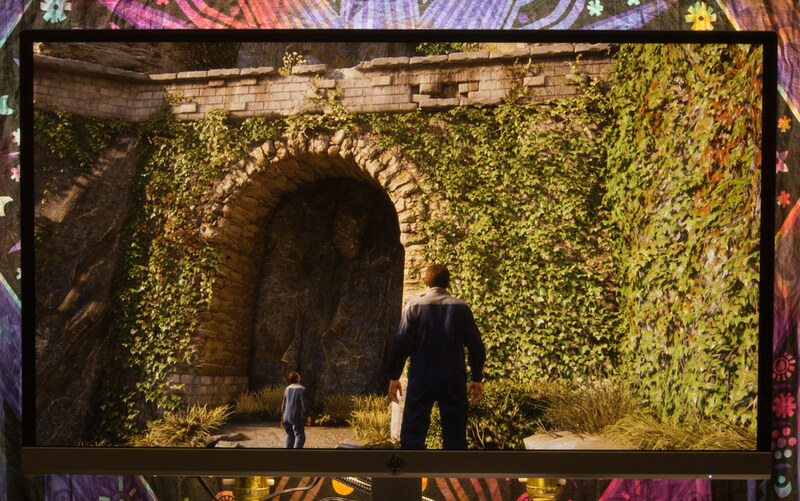 The preset green dominance in this screen shot from the start of Dying Light is quite apparent in this comparison, but it is quite normal for affordable monitors to suffer from obvious preset color accuracy flaws, especially grey scale flaws. 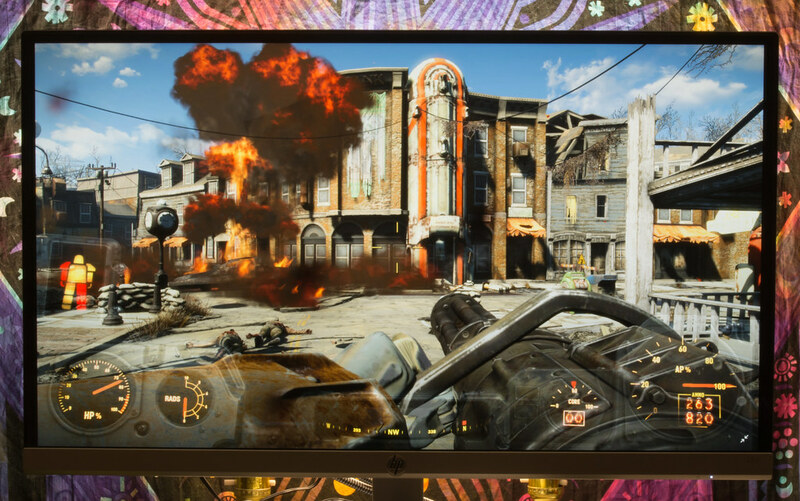 The preset green dominance is not obvious in this screenshot from Fallout 4. 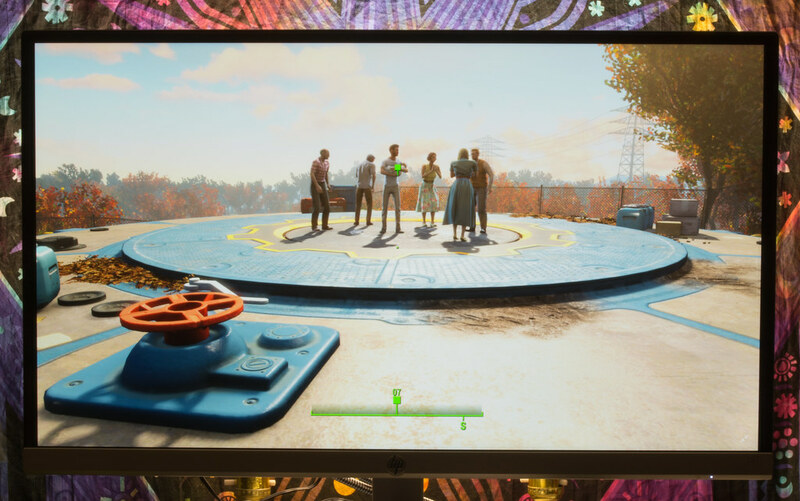 The preset green dominance is also quite apparent in this screenshot from the opening cinematic of Fallout 4. Glow is not a problem unless trying to look down at, or view the monitor from above, which is the incorrect way to view an AHVA/IPS/PLS panel.  The 25f suffers from the same amount of glow as its 2015 and 2016 predecessors from HP, and slightly more glow than the higher end HP 24 Envy from 2017. The HP 25f suffers from very obvious back-light bleed in the bottom left corner, which I found surprising since all seven of the older models I tested were back-light bleed free.  The back-light bleed combined with the perceived black depth reducing fake bezel/frame-less casing's inner black bezel decreases the perceived black depth and makes black look greyer or more washed out in dark content, especially if the brightness is cranked in a dark room. I can only fault the HP for its back-light bleed since almost every 1920x1080 IPS and PLS panel released sine 2011 has used a panel with fake bezel/frame-less casing. The low haze coating improves the perceived black depth more than matte coatings, but not enough to make a significant difference. 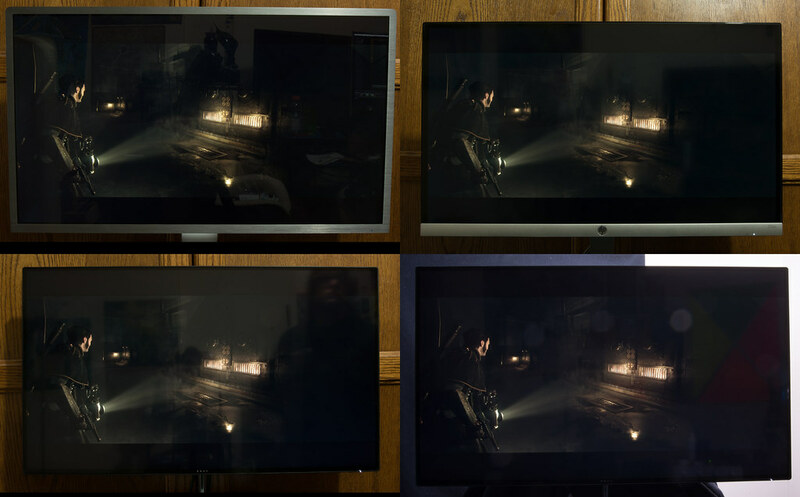 The perceived black depth offered by fake bezel/frame-less cased monitors is poor compared to panels with matte grey, silver and white casings, but can be improved by either using very bright room lighting (not recommended due to reflections), or bias lighting, which is lighting placed behind a display, and what I recommend using. Read my article or watch my video about bias lighting here: Display Brightness & Room Lighting: The Importance Of Light. 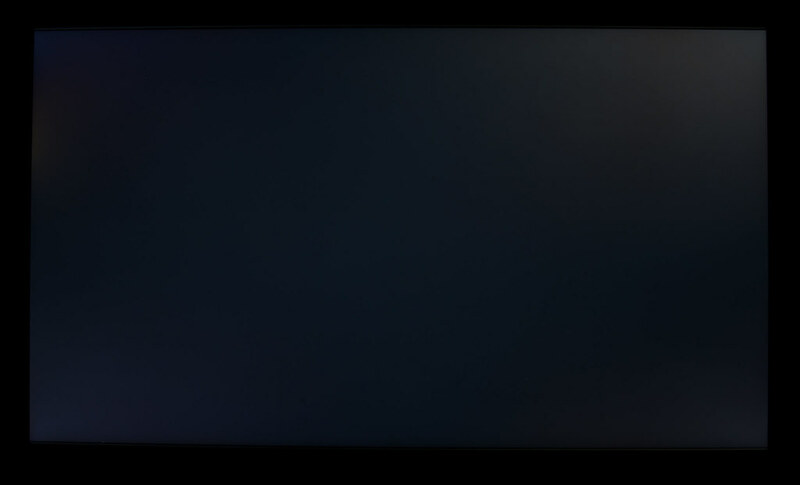 The Acer, despite being a high end or flagship mode, has the lowest calibrated contrast and worst back-light uniformity in the dark, but looks better than the HP when the lights are on since the Acer has a perceived black depth increasing dark matte grey bezel, and has less obvious back-light bleed. 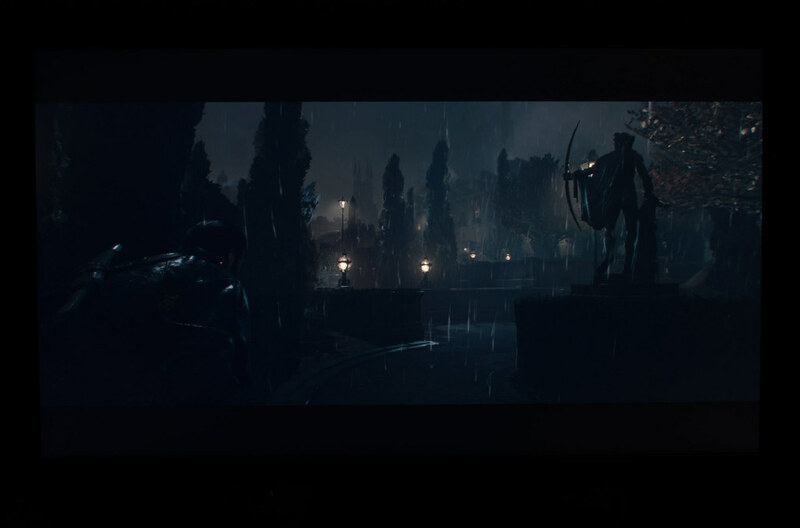 My The Order 1886 Lights Off 15s album contains photos of many displays ranging from 130-1200$ US MSRP.  The Samsung uses a VA panel with horizontal gamma shift and blue glow near the sides when displaying dark greys. It does have the highest contrast, but the Acer XB321HK and Qnix UHD3216R look better since they use gamma shift free AHVA panels which are AUO's version of IPS. 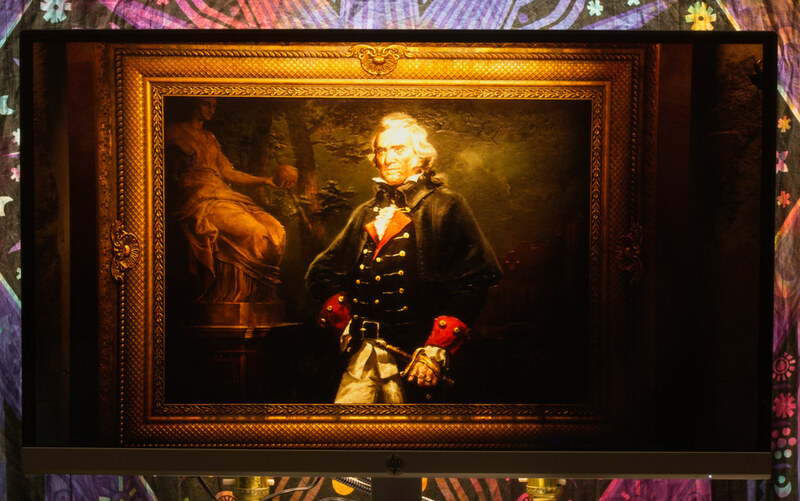 The HP and Viewsonic have the worst dark scene performance, though only the HP 25f's bottom left corner is worse than the Viewsonic which has lower contrast and more obvious uniformity issues in the top corners despite costing more than three times more than the HP. 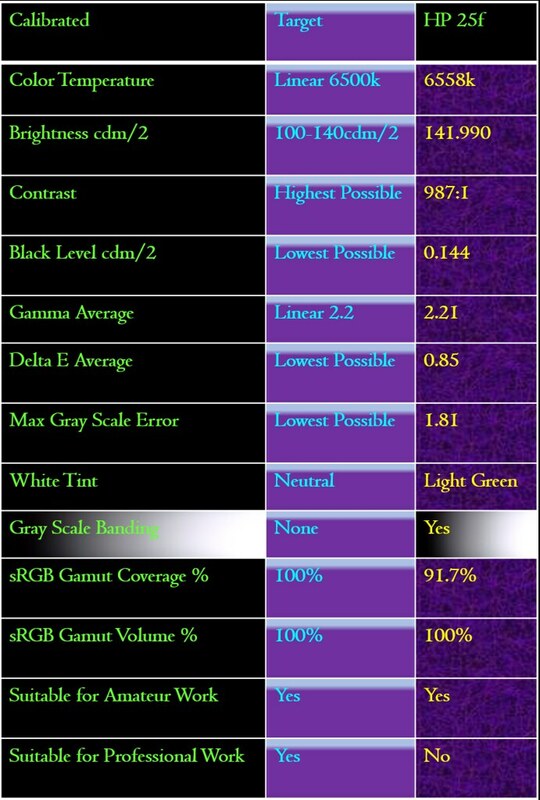 The HP 25f scales 1280x720 and 1920x1080 without issue, and automatically and correctly displays both RGB Limited (16-235) and Full (0-255) signals correctly, so the Playstation 4's RGB Range setting does not need to be changed. The PS3's setting does need to be set to Full with every display. Go to Settings>Video Settings>Scroll down and select 1080p 24hz Output Automatic. Go to Settings>Video Playback Settings and set Output at 1080p/24hz to Automatic.